The New England Patriots have started to refurbish their pass rush by trading for Carolina Panthers EDGE Kony Ealy, per ESPN’s Adam Schefter. The 6’4, 275 pound Ealy is 25 years old and was the Panthers 2nd round pick in the 2014 NFL Draft. The Patriots are sending the 64th overall pick to the Panthers in exchange for the 72nd overall pick in the third round, per ESPN’s Field Yates. 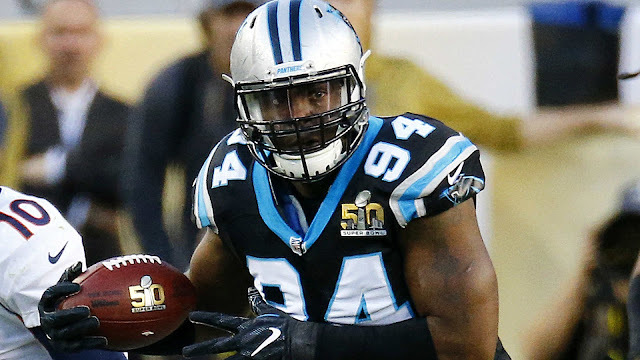 Ealy has 14 sacks over 47 games in a rotational role for the Panthers. Ealy played 37% of the snaps as a rookie and had played nearly 60% of the Panthers snaps over the past two season. He also registered 3 sacks, a forced fumble, a fumble recovery, and an interception in a Trey Flowers-esque performance during Super Bowl 50 against the Denver Broncos. Over the first six weeks of the 2016 NFL season, until the Panthers bye week, Ealy played 67% of the Panthers defensive snaps and recorded just 1 quarterback hit and 1 pass defended. After the bye week, Ealy’s role was reduced to 53% of the snaps, but his production surged with 5 sacks, 1 quarterback hit, 1 interception, 1 pass defended, and 1 forced fumble. Ealy will join Flowers and Rob Ninkovich as the Patriots edge players and could play a similar role to Jabaal Sheard in 2015. The Patriots could still add another pass rusher in the draft or in free agency, but Ealy certainly helps fill a need on the Patriots edge and is a perfect fit for the Patriots 4-tech defensive lineman role in the 5-man front, allowing Flowers to possibly take on a more aggressive pass rushing role. And even if Ealy is nothing more than the 4th pass rusher in the rotation, he only cost the Patriots 8 draft places in an extremely deep draft. This is a brilliant trade by the Patriots. The Patriots now own the 72nd, 96th, and 103rd picks in the third round. 0 Response to "Carolina Panthers trade DE Kony Ealy to Patriots"